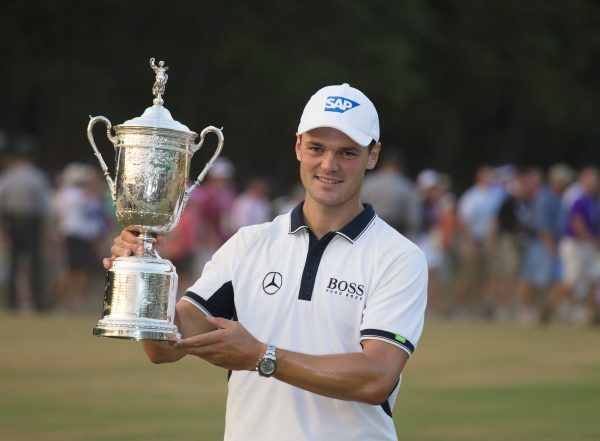 Germany’s Martin Kaymer has captured his second career Major Championship, taking the top spot at the 2014 U.S. Open by a massive eight shots in a dominant wire-to-wire victory. Kaymer’s blistering opening rounds of 65-65 set a new 36-hole record for a U.S. Open, and proved to be too much for the field to overcome. In the end, only Rickie Fowler and Erik Compton were anywhere close to 29-year-old Kaymer, both finishing at -1, the only other players to finish in red figures. To many, the tournament outcome appeared imminent from Friday, with Kaymer playing solid, near-error-free golf throughout. Only a late bogey on 16 on Sunday prevented Kaymer from joining Tiger Woods and Rory McIlroy as the only players to finish a U.S. Open in double digits under par. The victory gives Kaymer his second Major (PGA Championship, 2010) and he joins Seve Ballesteros, Ernie Els, Woods and McIlroy as the only players to win two majors and be No. 1 in the world before turning 30 since the world ranking began in 1986. Brutally slick greens (teetering near “unplayable” in the words of Matt Kuchar) proved to be the undoing for many on the revamped Pinehurst No. 2 course, despite the much-hyped elimination of the standard “U.S. Open Rough”, which was replaced in favour of equally penal waste areas and wire grass. Phil Mickelson, who has been runner-up six times in the event and was aiming to complete his career Grand Slam, finished T28 at 7-over. Of the Australians, Jason Day was best placed, finishing T4 at +1. Adam Scott also cracked the Top-10, with a T9 finish at +2. Aaron Baddeley was the only other Aussie to make the cut, with a respectable T23 at +6. HERE’S a few good U.S. Open bets any bookmaker would have laid. Martin Kaymer will set a course record 65 in the first and second rounds and take a six-shot lead into the weekend. Kaymer will make only one bogey in the first 36 holes and win the tournament by eight shots. Kaymer will complete a “Parental Double”; victory at the Players Championship (in June on Mother’s Day) will parlay into a U.S. Open victory (Father’s Day in the U.S.). He will become the first player to win on both Mother’s Day and Father’s Day since Tom Kite in 1992. Hunter Mahan and Jamie Donaldson will be penalised two shots for hitting each other’s ball during the second round. They will both miss the cut, with Mahan missing by one shot. Jeff Maggert, who twice finished third in the US Open, will score a 10 on the par-5 fifth hole. Australian amateur Oliver Goss will be two shots ahead of Adam Scott and Jason Day after round one. US Masters champion Bubba Watson and Lee Westwood will miss the cut. On the other side of the coin, the greens were predictably brutal. Charl Schwartzel missed a three-metre putt at the 12th and watched in disbelief as his ball rolled more than 10 metres past the hole and off the green. Phil Mickelson, too, couldn’t keep the ball on the green—while simply attempting to mark it! 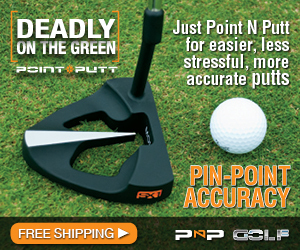 He had to move it two metres to the right, no nearer the hole, to find “grip” on the slick putting surface.